As you might already know, ClusterControl runs on a dedicated host. 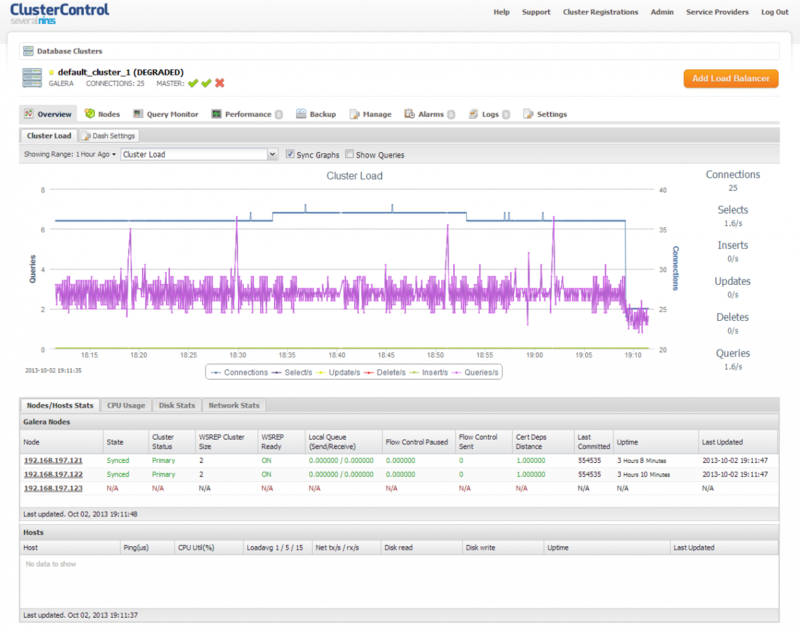 Failure of the ClusterControl host (or the datacenter it is running in) does not affect your running database cluster, however you cannot manage the cluster during that time. This is inconvenient. To guard against this, it is possible to deploy a standby ClusterControl server and increase the availability of your management infrastructure. 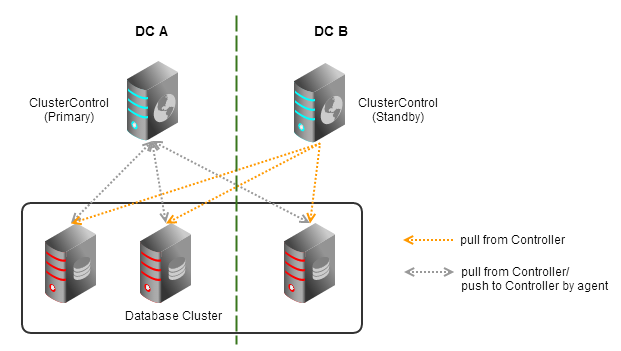 Let’s first have a look at how ClusterControl gathers data from the cluster nodes. As shown in the diagram below, the controller pulls database stats and variables directly from the managed database nodes. 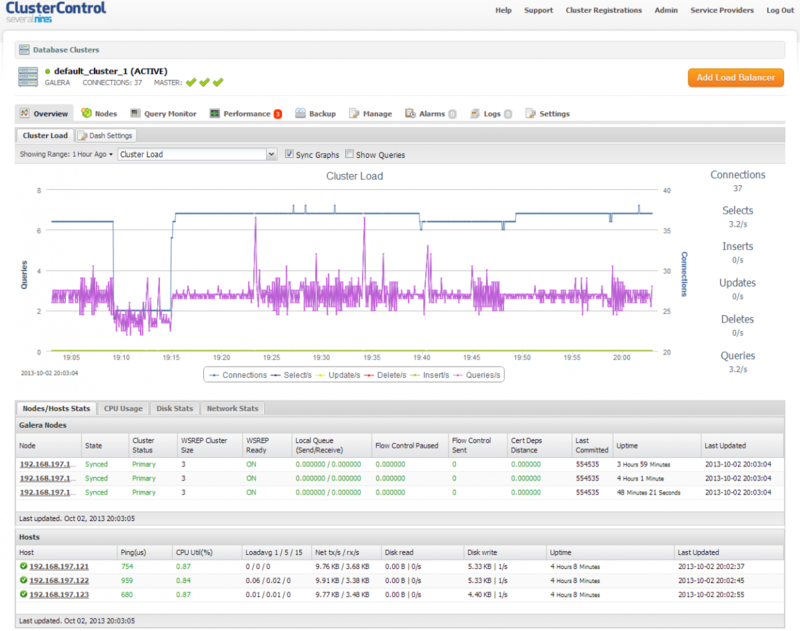 Host stats are collected by agents that run on the managed database nodes. These agents push the stats data to the controller. make sure that the standby host has sufficient privileges to pull database stats and accept host stats reported from the database hosts. Bear in mind that each ClusterControl agent can only report to one controller at the moment. So in case the main controller is down or inaccessible, you should simply change the agent’s mysql_hostname value in /etc/cmon.cnf to the standby controller host. Follow the installation wizard, and it will guide you through the installation process. You will end up with ClusterControl UI page. For advanced users with custom setups, if you prefer to install using the manual way, please follow these instructions to have more control on the installation process. At the end of the installation, you should be able to access the standby ClusterControl UI at http://<standby_ClusterControl_IP>/clustercontrol. Note that you will not have any host statistics in your UI, since the ClusterControl agents are only pushing host information to the primary ClusterControl server. That’s it for now. We are working on an exciting new feature to automate this process so please stay tuned.